MESA, Ariz. (AP) Oakland Athletics pitcher Liam Hendriks wants to taste soy sauce ice cream. Teammate Marco Estrada is hoping to spend a day at Tokyo Disneyland. Athletics manager Bob Melvin just needs to pack. 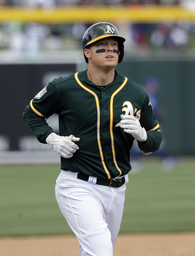 Melvin and the Athletics head to Japan on Thursday for the major league opening series against the Seattle Mariners at the Toyko Dome on March 20-21. The A's and Mariners also faced each other in the last opening series in Tokyo, splitting two games in 2012. The Chicago Cubs and New York Mets played there in 2000, the New York Yankees and Tampa Bay Devil Rays in 2004, and the Boston Red Sox and Oakland in 2008. Oakland went on to win the AL West seven years ago and reach the Division Series. "In `12, it was very impactful for us," Melvin said Wednesday. The trip provides a break in the spring training routine. When the Athletics get back, they have three exhibitions against San Francisco before resuming the season March 28 against the Los Angeles Angels. "You get so caught up in baseball here and your routine here, they're going to see that baseball is played a little differently there," Melvin said. "The crowds are different. There are a lot of fun things that you'll kind of expand your horizons and understand that internationally, it's a little different than what we do here and I think it will be good for them in the long run." Hendriks, a 30-year-rght-hander, can't wait. The Australian spent part of the offseason in London, Paris and Italy. "I'm really excited because I'm a big history buff and, obviously, Japan is rich with history," Hendriks said. "I'm excited to go check out some of the sites." His wife has done some research and wants to check out the Toyosu Fish Market, the Ginza shopping area and the botanical gardens. "My wife and I love to travel," Hendriks said. "We're always looking at places. We'll go, see what we need to see and then we'll go back." Melvin wasn't sure whether he would find time to see much of Tokyo. "I don't know about sightseeing but maybe find a restaurant or two," he said. "The last time, I didn't do any of that. The second time around, maybe take some time to smell the roses a little bit and look around. It should be a fun trip." Estrada, 35, who will start the second game in Tokyo, said he'll do his research during the long flightThursday. He's prepared for the loud drum-beating crowds at the Tokyo Dome. "I'm excited about everything, about checking out the entire country," Estrada said. "I want to venture out and check out some restaurants and maybe try to bring back some of the Japanese whiskey." The A's will take 30 players among a traveling party of 160, must pare the roster to 28 for the two games and designate 25 active for each game. Melvin knows it will be an emotional two days for Ichiro Suzuki, the 45-year-old Mariners outfielder who may be playing his final big league games. "He's had quite a flare for the dramatic over his career," Melvin said. "I'm hoping he doesn't come up in a situation that could hurt us. I know there will be some emotion involved in what he's going through." Usually, when Suzuki is in town for a series against the A's, the outfielder gets together for dinner with Melvin, the Mariners' manager in 2003-04. There may not be time on this trip, Melvin said. "I don't know that there's been a more impactful player, at least since I've been doing this, than Ichiro," Melvin said. "He was beloved there. He'll be in the Hall of Fame there. He'll be in the Hall of Fame here. ... He's one of the more impactful players for me in baseball history." NOTES: Opening day starter Mike Fiers had a rough outing in his last spring training game on Wednesday, allowing three home runs over 3 1/3 innings against the Chicago Cubs on a blustery day at Hohokam Stadium. "It's not like any of those homers were sneaking over the fence," Fiers said. "They had some good swings and made it tough on me." Fiers said he expected to be able to throw 75-80 pitches in the opener. ... LHP Jesus Luzardo will not make the trip to Japan but will start one of the exhibitions games against the Giants.